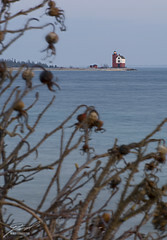 While on Mackinac Island for the "Spring Fling on Mackinac Island" event we ran down to the shore for some sunset photos. Our primary target was the Round Island Lighthouse. Unfortunately I only had the 17-55mm and the 105mm Micro, so we had to use the 105mm Micro for these telephoto shots.